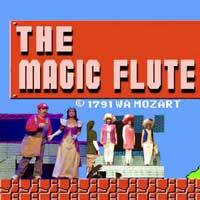 Mozart's whimsical adventure leaps from the 1790s to the 1990s and lands in the world of vintage video games, in this inventive new production by the Pacific Opera Project. This clever twist on the classic follows Papageno, Tamino and the whole Magic Flute gang on their Mario Brothers-inspired quest, while supplying them with a new English libretto by Josh Shaw and Scott Levin. Designed for both kids and adults to enjoy, this show jumps off at the El Portal Theatre in North Hollywood.